This is a little trick I picked up a while ago which can help you get a more resonant, low bass drum tone. It can also be used to create a slightly pitched kick drum. Just check out my sampler cheat sheet which has the frequencies for different musical notes. The technique is actually relatively simple and can give you some almost TR-808 type of kick drums from a real drum set. First off, get a decent sounding kick sound. If this requires any compression, gating, harmonic effects, what have you, do that before this EQ plugin. Now insert a simple Parametric EQ. Choose a low band, and crank the gain up quite a bit, like 15 dB. 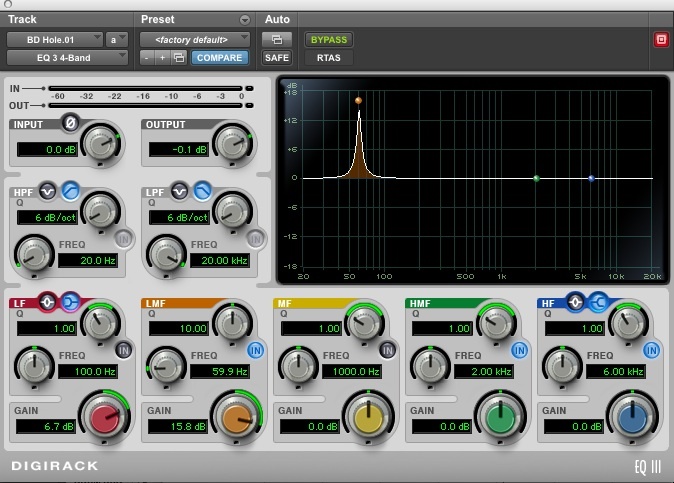 The key is that you want to make the “Q” as narrow as your EQ will allow. This kind of turns the EQ into a resonant filter at whatever frequency it is set at. Now, sweep that frequency around until you find one of the drums natural resonant frequencies, and you should start to get a nice low frequency ringing/sine wave sort of enhancement for the kick. You can choose to reinforce the natural resonance of the bass drum or you can choose a frequency which corresponds to the root pitch of the song. This can be overdone, so watch out. If you add too much and the tonality is different than the song then you will get some weird stuff going on between the bass and kick drum. I have posted a little audio example. This kit has no effects, eq, or anything except a tiny 1-2 db gain compression from the BF76 in Pro Tools across the Drum Subgroup. Use decent speakers as this demo contains some bass frequencies not heard on smaller systems. This entry was posted in Pro Audio Tutorials, Tutorials and tagged 808 style live kick, Add lows to kick, boost bass, EQ tip, mixing drums. Bookmark the permalink.